Young people without a job will be guaranteed the offer of employment, training or further education under a new decision agreed yesterday (28 February) by EU national ministers. The new scheme, to be introduced by each EU country according to its individual need, will apply to young people who are out of work for more than four months. It aims to give them a real chance to further their education, or get a job, apprenticeship or traineeship. One in five young Europeans is jobless. In countries such as Greece and Spain, half are unemployed. "Too many young Europeans are asking if they will ever find a job or have the same quality of life as their parents," European Commission President José Manuel Barroso said, welcoming the ministers’ decision. "They need answers from us. That is why, for the past two years, the European Commission pushed the urgent need to tackle youth unemployment to the top of Europe's political agenda,” Barroso added, urging EU countries to implement the scheme as soon as possible. A €6 billion pot in the EU budget for 2014-2020 has already been set aside to tackle youth employment in regions with high levels of unemployment. But this is too little, according to the European Youth Forum, a civil society group. “The €6 billion allocated is not sufficient in order to bring in an EU-wide Youth Guarantee and is unlikely to even be sufficient to tackle youth unemployment in the regions identified as having a youth unemployment rate that is higher than the EU average,” said says Peter Matjaši?, president of the European Youth Forum. According to a Eurofound report presented yesterday, the yearly cost of young NEETs (Not in Employment, Education or Training) has reached €153 billion in 2011. European enterprises currently offer training positions for a total of about 9.4 million students. Apprenticeship-type students represent approximately 40.5% of total secondary education students in the 27 member states. In countries with high proportions of young apprentices relative to the employed population – Austria, Germany and Switzerland – youth unemployment is much lower than other countries. In 2007 some 1.6 million young people were in apprenticeship in Germany, or 40 apprentices for every 1,000 employed people. During its January plenary session, the European Parliament approved a resolution calling on EU employment ministers to agree that all member states introduce these schemes. MEPs have also asked for the Youth Guarantee schemes to be eligible for EU funding, in particular from the European Social Fund, which they said should get at least 25% of EU structural and cohesion funds. “What we need is a Youth Guarantee that is not just words to ‘label’ existing policy or funds, but a substantial investment in upskilling and bringing young people in the labour market,” says Peter Matjaši?, president of the European Youth Forum. “Today is a turning point, after the European Parliament, the European Commission and the European Council recommendations, we regret the reservations of so many Member States and hope all reluctant Member States will now start really investing in young people,” added Matjaši?. Pervenche Berès, the chair of the European Parliament's Employment and Social Affairs Committee (Socialsits & Democrats, France) welcomed the creation of this first EU instrument to tackle youth employment. “The Youth Guarantee is a first response not only to youth unemployment which stands at 23.4% in the EU but also to the necessary social dimension of action needed to get out of the crisis. The Parliament will therefore fight for the European Social Fund to be allocated at least 25% of the EU cohesion budget", said Berès. Liberal MEP Nadja Hirsch said too many young Europeans are drifting away from the labour market. Across Europe, 7.5 % of young people are in neither employment nor education nor training. “Investment in Youth Guarantee schemes is one of the key measures to avoid us literally losing an entire generation. The economic cost of youth unemployment for EU Member States is estimated at 1.2 % of EU GDP. The success or failure of the Youth Guarantee therefore has both a socio-political component and directly impacts on Member States' budget deficits through social security payments,” Hirsch said. “This decision should be seen as a great start of our journey to rebuild the futures of millions of young people left stranded by weeks, months, or years of unemployment, said Sergei Stanishev, president of the Party of European Socialists (PES). PES Women President Zita Gurmai added: ”This is a huge success but not the end of the road. Now, we need to increase funding to 10 billion euros so that we can bring the Youth Guarantee to all corners of the EU – and we need to ensure that we implement a Guarantee of quality. The Gender Dimension of the European Youth Guarantee must be integral to its success, she added. In Parliament, the European People's Party (EPP) Group still has reservations about the financing of such an instrument at member state level, especially in the face of the recent uncertainties about the new Multiannual Financial Framework. “All 27 Member States face different challenges in the field of youth unemployment, requiring special, tailored solutions. We will see whether the €6 billion set aside will be enough to implement the youth guarantee scheme effectively," said Csaba ?ry MEP, EPP Group Spokesman in the Employment and Social Affairs Committee of the European Parliament. "I cannot emphasise enough the importance of the cohesion funds, in this field particularly, the European Social Fund. These funds should remain untouched and should be used for concrete projects. Funds for real job creation should not be diverted." 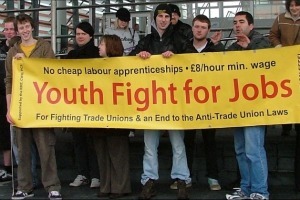 The European Commission last December presented a proposal aimed at tackling youth unemployment across Europe. The new package includes the so-called "Youth guarantee". It is a tool that hopes to ensure that all youth under 25 receive a quality job, internship or education offer within four months of finishing school or becoming unemployed. Youth unemployment is on average twice higher than the rest of the working age population in Europe. In Italy, it has risen to some 35% and in Spain and Greece, it even reaches over 50%. The Youth Employment Package builds on the endorsement by the European Council on 29 June 2012 of both the Youth Guarantees concept and the usefulness of a quality framework for internships. The Council’s focus on youth employment is vital, and more can be done to reform Europe’s labour markets in order to have a greater number of young people obtaining work. Talk of a lost generation is not idle, and the longer European governments do not act decisively to get young people into work or training, the more difficult it will become in the long run. People aged 25 and under are strongly represented in the private employment services sector. Thanks to the EU temporary agency work directive we provide good quality jobs with equal treatment and pay and we provide many young people their first experience of the labour market. A recent study commissioned by Eurociett and its sectoral social partner Uni Europa proved the positive role that temporary agency work plays in facilitating labour market transitions. In Germany for example, 60% of people obtaining agency work jobs were long term unemployed or had never worked before. In their joint recommendations signed in December 2012, both social partners stressed the need for appropriate regulation on temporary agency work, constructive sectoral social dialogue and more cooperation between public and private employment services. Given that education, training and labour market laws are the responsibilities of national government one wonders why on earth the EU is getting involved in this. My only conclusion is that there are underemployed MEPs who wish to show that “something is being done”. It is difficult not to have the view that a large amount of EU activity comprises makework schemes for insiders, MEPs, EU officials, and of course the lobbyists. Whether this expensive activity translates into cost-effective outputs for citizens and taxpayers is highly doubtful.